Where we were [hillside suburb of Mt Pleasant] was actually the epicentre of the earthquake, which occurred at 9 minutes to 1p.m. We immediately got under the dining room table. The quake was very sharp and the whole ground bucked and heaved. It was very shallow and the devastation was immediate. Everything came off the walls, the china cabinet and all the crystal, nearby crashed around us. In the kitchen, 2m away, the cupboards emptied, the built-in wall oven crashed onto the floor followed by the built-in microwave. Then the big refrigerator with bottom freezer fell on top of all that. Broken glass everywhere. In the room we were in, there were 6 mm plate glass windows that were smashed, and likewise in the adjacent living room. But the house held in front. Not so in the back. The back wall was bricked and had a French door: the wall collapsed and the door jerked out and away from the house so it is wide open (and thus open to looters). The adjacent walls were half brick and they too were wiped out. Banks of rocks and solid ground near the house collapsed and made it difficult to get out. The road outside had a big crack and the sidewalk dropped 20 cm relative to the road and a gap opened 8 cm wide. The water main broke just above there and water cascaded down past the front of the house, making it a wet experience getting to my rental car, which was OK.
Trenberth spent today in Christchurch helping the rescue effort, along with many, many others. 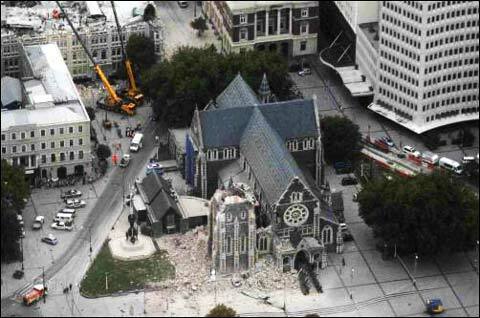 You can get some idea of the size of this event by looking at aerial pictures taken by the NZ defence forces: aside from the building damage in the central city, extensive damage has occurred in many suburbs and soil liquefaction and flooding is affecting tens of thousands of homes. Power is out in 50 per cent of the city, and the mayor has described the water and sewer systems as “trashed”. Recovery is going to take a very long time, but recover and rebuild we will. Earth science geeks will want to check out the Christchurch Quake Map here (link takes you to last seven days — use the drop down to select Feb 22) for a remarkable visualisation of the earthquake sequence we’ve been experiencing, and the Highly Allochthonous blog has an excellent description of the tectonics of the quake here. It also worth noting that the quake caused a major calving event on the Tasman Glacier lake near Mt Cook. An estimated 30 million tons of ice broke off the glacier tongue when the quake hit. I hope that Hot Topic readers will understand if my contributions to the site are somewhat disrupted over coming weeks. My focus will be elsewhere, and at the moment it’s very difficult to take the future for granted. A lesson for us all there, perhaps? Update: this amazing picture of the clouds of dust rising from the city moments after the quake hit looks to have been taken from one of the hill suburbs. Hat tip to @georgedarroch on Twitter, photographer unknown*. Click for full size.